The Government of India has decided to advance the presentation date of the Union Budget by a month from February to January with an objective get all allocations at different tiers disseminated to budget-holders, before the financial year begins on April 1. After the decision, Union Budget 2017-18 was the first Budget presented on February 1, 2017 instead of February 28. The decision became a subject of national debate with many politicians, economic experts and fiscal policy experts weighing pros & cons on the topic. The legacy of presenting the Union Budget on last working day of February has been done away with. Since the British period Union Budget has continued to be presented on February 28 or 29 in a leap year. Government has found the preponed date of Budget presentation a better idea as it will solve many issues like delay in start of implementing the budget proposals. Earlier, during Atal Bihari Vajpayee’s NDA government, the then finance minister Yashwant Sinha had also departed from the tradition of presenting the budget at 5PM and changed the time of the presentation of the Union Budget at 11AM in 2001. Since then 11AM Budget presentation time is followed. The Finance Ministry had proposed that the Budget Session be convened before 25 January, a month ahead of the current practice. It looks fine as it may be more convenient for the Union Government to pre-pone the Union Budget presentation date and to get the Budget constitutionally approved by Parliament and assented to by the President. The move of the Government, however, not only breaks the established practice but is also considered fraught with number of issues which could hinder the correct or nearly correct estimation of expenditure and income for next year as well as the scrutiny issues. Less time with parliament as for nearly 10 days in the latter part of January, ministers and their officers are distracted from parliamentary work owing to their involvement with Republic Day celebrations and follow-up events. Accordingly, when the budget in general and the detailed demands for grants from a number of ministries with annual allocations of over, say, Rs. 20,000 crore are deliberated upon by the standing committees, and debated and voted by the houses before the appropriations Bill (conveying legislature`s approval to the executive to draw from the Consolidated Fund of India), is passed by Parliament and assented to by the President, a period of 10-11 weeks is required. During the re-scheduled session, that much time may not be available to Parliament. Earlier estimated figures for the month of February used to be incorporated as it was necessary since many cash crops and potato crop made their arrival in the market. Now with the date advancement to January, it may not be possible to take into account both January and February months’ figures. -According to economists, it would be better if the budget presentation could be shifted to mid- or end-March so that February’s “actual” figures can also be taken into account. In the first early presented budget on February 1, 2017, it was more estimates than actual as the figures and data from various quarters including states could not be received and compiled with due diligence to arrive at correct budget allocations. Lack of comprehensive revenue and expenditure data is major disadvantage in early presentation of budget. In fact the work on calculation, estimation for the Budget begins in December. It is finalised in mid-February with the data on revenue collections and expenditure trends available for the first nine months of the financial year – April to December. Now for Budget in January, the Government will have to start preparing it by early October with the data for six months. This will present an incomplete picture. 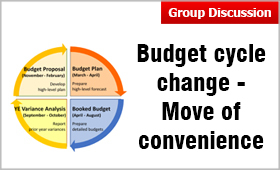 Budget planning also depends on the monsoon forecasts for the coming year and it will make the advancing of the Budget presentation date even more difficult. The inputs from the PFMS on the entire gamut of the Centre’s expenditure are not expected to be fully available for assessing expenditure in the terminal phases of the current year to enable budget preparation of the ensuing year. Fine-tuning of budget allocation to different areas may not be possible now as the budget proposals are based on three quarters of the current year’s expenditure and partially on anticipated trends till the end of the year. According to the former finance minister, Yashwant Sinha, the outgoing year’s fourth quarter will remain a “dark area” while formulating budget for the next year. Budget scrutiny has remained a very important part before budget presentation. It may be overlooked now due to paucity of time. According to political analysts, early budget presentation has political motive also as the move was announced when there were state elections in Uttar Pradesh, Punjab, Goa, Manipur starting from Feb 4th. Early budget will make available the funds at the disposal of the executive authorities entrusted with Budgets and expenditure responsibilities, to the full extent of their annual requirement, by March 31. Parliamentary approval of the final batch of supplementary demands, for additional budgeted funds and re-appropriation relating to the current financial year, could be feasible a few weeks before the end of the financial year. This will enable additional releases from the Centre to the States in February or early March. The State governments will consequently get more time to actually utilise the funds which may become available to them as a result of early budget allocation. Earlier States used to receive the last tranche from the Centre at the end of March and had to place such receipts perforce in a transitory accounting head or ‘civil deposits’, for utilisation in the next financial year which was against financial principles. The new system will eliminate the need for the executive to obtain a vote-on-account budget approval to incur expenditure during the first two months, which normally is in the second fortnight of May. The aim is that all spending authorities within the system and those financially dependent on the Centre be in a position to work out their activities with assured resources in the beginning of the year itself. Good or bad: Think now!